A review is presented summarising the leaching of gold with ammoniacal thiosulfate solutions, and evaluating the current use and development of ion exchange resins for the recovery of gold and silver from such leach liquors. Comparisons are also made with other recovery processes, including carbon adsorption, solvent extraction, electrowinning and precipitation. 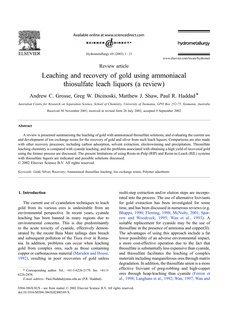 Thiosulfate leaching chemistry is compared with cyanide leaching, and the problems associated with obtaining a high yield of recovered gold using the former process are discussed. The present limitations of using Resin-in-Pulp (RIP) and Resin-in-Leach (RIL) systems with thiosulfate liquors are indicated and possible solutions discussed.